The Center for Sustainable Landscapes exterior with constructed wetlands and lagoon at Phipps Conservatory and Botanical Gardens. Credit: Denmarsh Photography Inc. 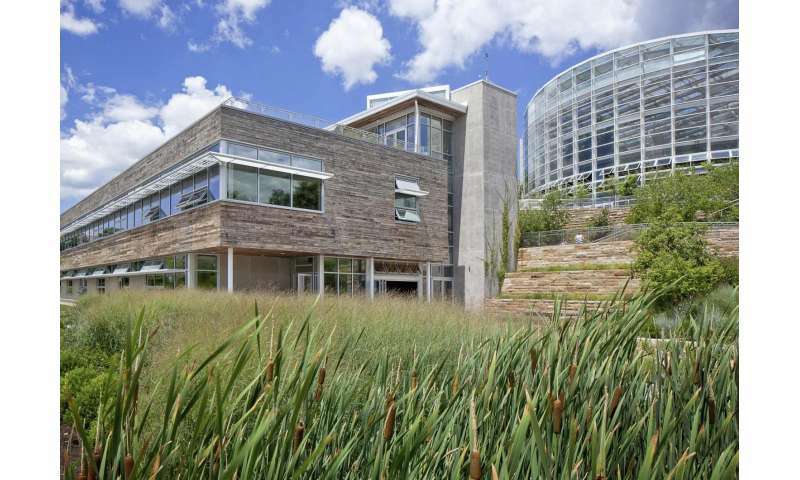 The "decentralized" water system at the Center for Sustainable Landscapes (CSL) at Phipps Conservatory and Botanical Gardens, which treats all non-potable water on site, contributes to the net-zero building's recognition as one of the greenest buildings in the world. However, research into the efficacy of these systems versus traditional treatment is practically non-existent in the literature. Thanks to a collaboration between Phipps and the University of Pittsburgh's Swanson School of Engineering, researchers now have a greater understanding of the life cycle of water reuse systems designed for living buildings, from construction through day-to-day use. "Evaluating the Life Cycle Environmental Benefits and Trade-Offs of Water Reuse Systems for Net-Zero Buildings," published in the journal Environmental Science and Technology (DOI: 10.1021/acs.est.6b03879), is the first-of-its-kind research utilizing life-cycle assessment (LCA). Co-authored by Melissa M. Bilec, associate professor of civil and environmental engineering at Pitt and deputy director of the Mascaro Center for Sustainable Innovation (MCSI), collaborators at Phipps included Richard Piacentini, executive director; and Jason Wirick, director of facilities and sustainability management. Pitt PhD graduate student, Vaclav Hasik, and Pitt undergraduate, Naomi Anderson, were first and second authors, respectively. "As water becomes more of a precious resource around the globe, there is a greater focus on developing new methods of water efficiency and water conservation," Dr. Bilec said. "We've worked closely with Richard and Phipps since the CSL was first designed, and its decentralized water system provides a unique opportunity to explore how these strategies can be an alternative to traditional systems." According to Dr. Bilec, LCA scientifically analyzes the environmental impact of a product or process throughout the entire life cycle, from the materials used to build a system, to their transportation, construction, use, and, eventually, the estimated end of life. Although LCA has been used to compare centralized and decentralized water systems in different contexts, the Phipps CSL research is the first to consider both water supply and treatment at a comprehensive site or in the context of a net-zero energy/water building. "Using groundbreaking processes in the building of the CSL has allowed us to work with Pitt to conduct research and learn about their efficacy, and will allow others to use this knowledge to advance their own work," said Mr. Piacentini, Phipps executive director. "The only way to make a difference is by providing the resources for others to succeed." Dr. Bilec noted that while the research found that a decentralized water system operates well for a facility like the CSL, the environmental benefits or trade-offs for such systems are dependent upon their lifetime of use, and may not necessarily be practical or environmentally preferable. For example, a similar system might be more environmentally and economically efficient for a development of multiple homes or buildings, rather than one structure. Conversely, the relative impact of a decentralized system built in a water-scarce region may be more beneficial than its environmental footprint. The decision of what water system to build and its scale, she says, should be evaluated within the context of the entire life of the structure or site it supports. She also noted that research such as this is valuable because of the community-minded approach shared between Pitt, MCSI and Phipps, and its impact on students. For example, PhD candidate Vaclav Hasik is utilizing the CSL study to inform his dissertation on resilient and sustainable systems, while summer undergraduate Mascaro Center researcher, Naomi E. Anderson, was a key participant, illustrating the success of MCSI's summer program. "The CSL at Phipps is a tremendous case study because it has achieved four of the most sought-after awards in sustainable construction," Dr. Bilec noted. "Richard, his board and employees are incredibly forward-thinking and committed to not only the concept of a living building but also supporting its evolution through research, and that makes Phipps a wonderful collaborator. Opportunities such as this not only advance research in the field, but also provide a tremendous experience and inspiration for students." Other co-authors of "Evaluating the Life Cycle Environmental Benefits and Trade-Offs of Water Reuse Systems for Net-Zero Buildings" include William O. Collinge, postdoctoral associate, University of Pittsburgh; Vikas Khanna, assistant professor of civil and environmental engineering, University of Pittsburgh; Amy E. Landis, the Thomas F. Hash '69 Endowed Chair Professor, Glenn Department of Civil Engineering at Clemson University; and Cassandra L. Thiel, former postdoctoral associate, now assistant professor, New York University Robert F. Wagner Graduate School of Public Service. It would be interesting to find out the ratio of BOD/COD load and size and species complement of the conditioning wetlands. What kind of preconditioning is used before sending it to the living filter? Interesting how george the psychopath will make the effort to look up a few terms in order to make people think he is educated in a subject when everybody here knows that, hes not. "Many Psychopaths "make their living" by using charm, deceit, and manipulation to gain the confidence of their victims. Many of them can be found in white collar professions where they are aided in their evil by the fact that most people expect certain classes of people to be trustworthy because of their social or professional credentials. Lawyers, doctors, teachers, politicians, psychiatrists and psychologists, generally do not have to earn our trust because they have it by virtue of their positions. But the fact is: psychopaths are found in such lofty spheres also!" -But then along came HR, in large part because of the damage people like george had done. So he became a consultant and sat for 10 years. Too bad. Nice business cards tho -? Do the surfactants in the water affect water-striders, spiders, and others who count on the skin effect of surface tension? Lots of questions with a biological component in the physical/chemical system. So did you learn all these salient terms when writing your popsci-level MS thesis on how to design a cow farm without an engineering education or any knowledge of govt regs? Or did you just spend a few minutes on google like you always do? Psychopaths - they dont care whether people know theyre lying or not.